Below, you’ll find answers to some of the most common questions we receive about the Parent and Tot program. If we missed something, call your nearest Making Waves Swim School location or send us an email at info@mwss.ca. What should I bring to Parent & Tot class? You and your little fish in your favourite swimsuit or shorts! In addition, parents will learn how to hold their child during a back float along with basic first aid skills. 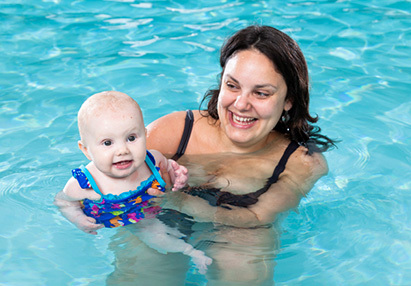 How will swimming classes benefit my baby? How can I help prevent a pool fouling? For everyone’s health and safety there are no outdoor shoes permitted in our change room areas or on the pool deck. You are welcome to bring indoor shoes. Strollers are permitted in the viewing area but we ask that you not bring your stroller into the change rooms or onto the pool deck. We love cameras and they are always welcome! Please feel free anytime to come out on deck and take pictures. If you snap a photo of your little fish that you would love to share, send it to info@mwss.ca or share it with us via social media. Two swim diapers with a snug fit around the legs and waist are REQUIRED for all swimmers under 36 months, as well as older children who are not fully potty-trained. Layer 1 can be any reusable or disposable swim diaper that you feel most comfortable with! The outer layer must be a reusable, cloth swim diaper. We recommend the “Happy Nappy!” Please help us prevent leakage into the pool, which causes a temporary pool closure. It allows you to watch your children in a comfortable environment while they swim in a warm one. You are welcome to sit on the benches provided on the pool deck. If you have a question or a comment please feel free to speak to your Head Instructor. As an added service we provide make up classes for medical reasons or family emergencies. This policy only applies if there is space in our schedules to accommodate your child’s level and the lesson must be taken within the same session that the class was missed. No monetary funds will be available for missed classes. Registrants are allowed a maximum of 2 make-ups per session.